Rise is conveniently located in the popular Glendale neighborhood of Denver. Rise is within walking distance of some of Glendale's hottest bars and restaurants, best shopping destinations and public transportation. Living at Rise puts you just minutes from downtown Denver in a newly renovated apartment community offering cutting edge finishes with an amenity package that's sure to please. Not only will you be living in an area that you love, our professional management team will also help to keep you connected and involved in the community. You won’t be disappointed by the awesome service that Local by Laramar provides, including our online resident portal that allows you to pay rent and communicate with our friendly management team from your phone or laptop. Our high quality finishes are thoughtfully selected with you in mind, and we provide it all at a great value for your money. Enjoy modern neighborhood living in Denver, and live where you love with Local by Laramar. Call us today for your personal tour! 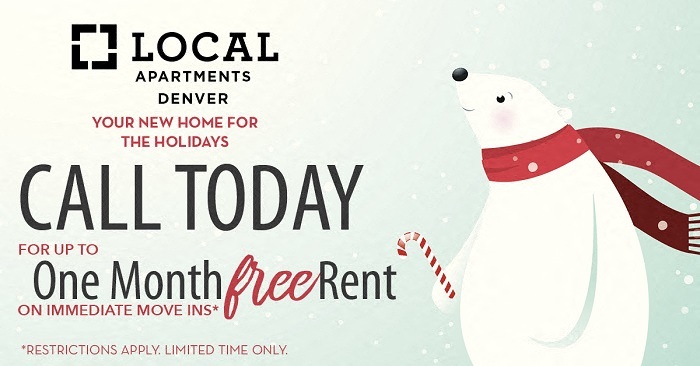 Up to one month FREE on select apartment homes! Restrictions apply.